Farmers Market Specials -- 9/13 - 16 + Hale Aina Awards + Happy Birthday, Mama Le! It is two special occasions for us this week. First off, the 2018 Hale Aina Awards presented by Honolulu Magazine is happening this Sunday at the Royal Hawaiian! We were fortunate and honored to win several awards last year, including Restauranteur of the Year that was shared between Chef Andrew and Mama Le. It was a total surprise and truly an eventful evening that we will never forget. This year, we are back and also nominated for the same categories, essentially, including Best New Restaurant for PIGGY SMALLS. We have to admit that the competition is extra tough this year and whoever wins, will totally deserve it, because 2017 has been a stellar year for the restart scene in Hawaii with several high level openings in the past few months. But, whatever the outcome, we are truly humbled to be a part of this community. Tickets are still on sale for this year's Hale Aina Awards. Come join the fun and see us there! Secondly, and more importantly, it is Mama Le’s birthday this Friday! 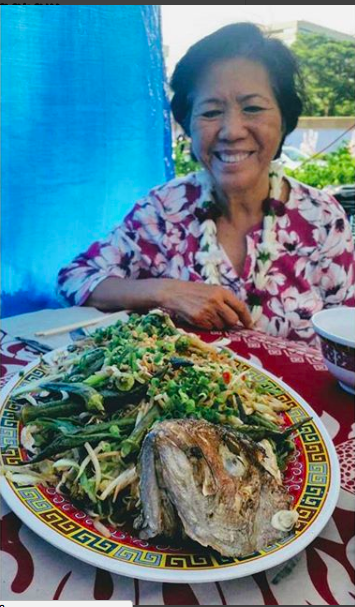 The true boss of this whole operation, Mama Le celebrated a fun dinner at the Blaisdell Farmers Market today with some close friends. She also had sake and beer! Although she is small, she can hold her liquor, which was pretty impressive, especially since she went shopping post-dinner! Anyway, if you see our matriarch this week, wish her a happy birthday! We are trying to organize a Vegas trip for her, since she loves to hit the blackjack tables. If anyone has gambled with Mama, she’s got a great strategy, feigning ignorance and asking “beginner” questions with the dealers and players on the table, but she definitely knows what she is doing, and many times, laughing all the way to the bank. Wish her luck because she will definitely bring her frog pin! To check our the rest of the menu and schedule, head over to the Farmers Market Page.